A fellow traveler and I were discussing upcoming trips and she proudly announced that she was going to be a passenger in a hot air balloon at the Albuquerque balloon festival. I had been there 2 years before and and it was amazing. We started comparing must-see lists and then she pulled out what looked like a novel on her phone. It was at that moment I realized that I have never “written” a list of what I want to do in my lifetime. I suppose the words “bucket list” comes from writing down the things we want to do before we “kick the bucket”. How is it that I’ve never put my list to paper, or even in the note section of my phone? Her list was staggering. It was 100 things to do in her lifetime. These Herculean tasks were spread all over the globe, but she was knocking them out, one adventure at a time. She wasn’t messing around. I’ve had an unwritten list in my head throughout the years, but it has occasionally changed with new information. I’ve always thought that the ultimate New Year’s Eve celebration would be in Time’s Square until I talked to a dozen people who did it and hated it. For a fleeting moment I thought I might want to try monkey brains…until I found out how you eat monkey brains.So, lists change. I was impressed that my friend had thought of 100 things she wanted to do and I started compiling my own TTD. When I hit 40 potential adventures, I decided that although a 100 items list is really inspiring, most people who have jobs, kids, pets,plants and other things that don’t do so well when you leave them on their own for a month or so. So, I created a list that I think is the perfect size for everyone: Twenty things. The twenty things must be fairly specific and possible. “Travel more” is too generic. “Dance the tango with the Dali Lama” is pretty clear-cut, but might be a little too difficult. I asked a group of my friends to give me one thing on “their list” and quite a few of them got stuck. Several couldn’t think of anything. If you don’t have a clear cut idea of what you want to do, then how can you ever get it done? Not having a travel plan is like driving around without having a place to go.How do you decide what you want to see? Look at these categories and you’ll find that making your list just got easier. Seeing exotic animals around the world is on a lot of bucket lists. A safari in Africa, going to visit penguins in Antarctica, viewing the polar bear migration in Manitoba, swimming with the dolphins or visiting an animal sanctuary in Costa Rica are all legitimate adventures. If you love animals and would like to see some in the wild, find a place that has what you’re looking for. I went to Indonesia to see Orangutans in the wild and did a tiger safari in Nepal. I got to feed Komodo dragons on the island of Komodo. There’s lots of great trips you can book or organize yourself. Do you love Italian food? Maybe a trip to Tuscany or Sicily might be right up your alley. If you’re adventurous, you can visit Mexico and eat ant eggs, grasshoppers, armadillo, iguana and lots of other creatures that don’t appear on the normal menu. If you love Greek salad, guess where the best Greek salad comes from? It tastes even better when you’re looking at a turquoise blue ocean on a Greek island. Some vacation packages even offer cooking classes or feature world renowned chefs. It might be ridiculously difficult to get a table, but Eleven Madison in New York City is now considered to be the number one restaurant in the world and eating there would definitely be a good Facebook check in. I’ve had an obsession with Easter Island since I saw a picture of the famed stone heads in first grade. When I finally arrived on the island as a adult, it was a dream come true. The world is full of amazing history and ancient cities and buildings from thousands of years ago. You can walk the streets of Pompeii, visit the shops and villas and imagine what the people who lived there thought about when they traveled down the same path. Ancient temples in Cambodia’s Angor Wat, treasures of Egypt, Roman ruins in Italy, the port of Malta, or China’s Great Wall are all fantastic places to visit and see. Pick up a list of UNESCO sites. There’s so much to explore. Visit places like Machu Picchu while you’re still young enough to climb the mountains. I collect countries. I’m going to every country in the world and I have two lists: one has the names of all the countries I’ve visited, the other is a list of the ones I haven’t. As I travel to a new place, I change both lists to reflect my travels. It’s pretty easy to visit all the countries that start with a Q. There’s only one. Congratulations. 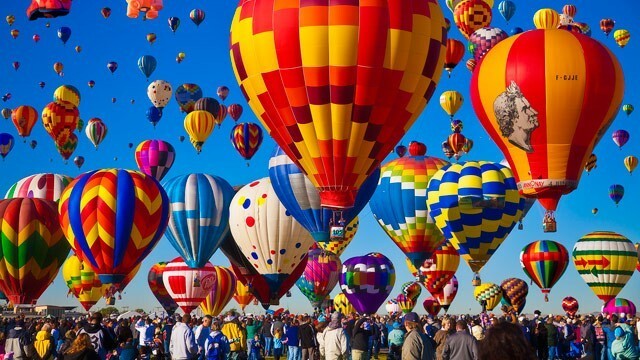 You’ve already been to all the countries that start with X and W.
The Albuquerque Balloon festival is an internationally acclaimed event and sees visitors from all over the world. The Calgary Stampede, Pamplona’s running of the bulls or visiting Ireland on St. Patty’s Day are on many bucket lists. Where is the best place to spend New Year’s Eve? I’ve celebrated in South Africa, Australia, Ibiza, and it’s always a unique experience in each place. I hear Moscow’s festivities trump anywhere else in the world so it’s one of the items on my list. Burning Man in Nevada and Oktoberfest in Germany are both on my list. The Christmas Market in Europe is probably the most fun you’ll ever have during the holidays. Some people love ghosts and there’s endless hotels that claim to be haunted, plenty of street tours in historic cities and graveyard tourism has a huge following. Almost any city has someone famous buried there and you can visit their grave by just showing up. No appointment necessary. If you love rock and roll, you’ll love visiting Jim Morrison’s grave in Paris or Jimi Hendrix in Seattle. Lizzy Borden’s house and grave are easy to find in Fall River, Maine if you’re more into the macabre. Haunted hotels like Stanley Park in Estes, Colorado or The Queen Mary ship in Long Beach can make for an interesting story and a restless night if such things make you nervous. Visiting the top ten most haunted hotels in the US could make an interesting entry on your bucket list. For many, just lying on a beach somewhere beautiful is enough to satisfy. Visiting the most exotic sun and sand locations in the world could be a priority for you. There’s not many places more beautiful than Bora Bora or Seychelles. A trip to the Maldives is a fantastic adventure where you can dive with whale sharks and lounge on palm fringed sugary sand. Google the most beautiful beaches in the world, find the one that speaks to you, and add it to the list. I just flew to Chicago to see American Gothic. I got a cheap flight for $76 with Spirit, and I took a day and half to visit some amazing art at the Art Institute of Chicago and a few other highlights of the Windy City. Many of the museum’s treasures were featured in the film Ferris Bueller’s Day Off, so it was even more interesting. The Louvre, The British Museum, The Hermitage, Musee de Orsay, or the amazing National Gallery of Art in Washington DC can all be destinations in themselves. Do you love the Venus De Milo? Fly to Paris and meet her. While you’re there, you can check off the Eiffel Tower, Notre Dame, and some of Paris’ other amazing sites. Do you love The Walking Dead? Breaking Bad? Those are two shows that I have really enjoyed, so I took a trip to Atlanta and visited the places where the show is filmed. When I visited the Albuquerque Balloon Festival, I had time to see Walter White’s house, Saul Goodman’s office, The Car Wash, Jesse’s home and lots of other places featured in the Breaking Bad TV show. Pick a show you really love, find out where it’s filmed and put it on your list. Who knows? You might even be able to get on the set as an extra. The scariest thing I’ve ever done was jumping off the Zambezi bridge in Zimbabwe at Victoria Falls. The world is full of crazy things to do for adventure junkies. Abseiling down the side of a downtown building in La Paz Bolivia, helicopter skiing, running with the bulls in Spain are all good examples of exciting trips you can do if lounging around bores you. A friend of mine is going to all the best zip-lines in the world. Americans are all imported from somewhere else and whether your family is Irish, Italian, Vietnamese or French, there’s a good chance that you can trace your roots to a small village where your great great great grandfather lived before he sailed to the New World. You might even have family that you don’t know about it still living there. 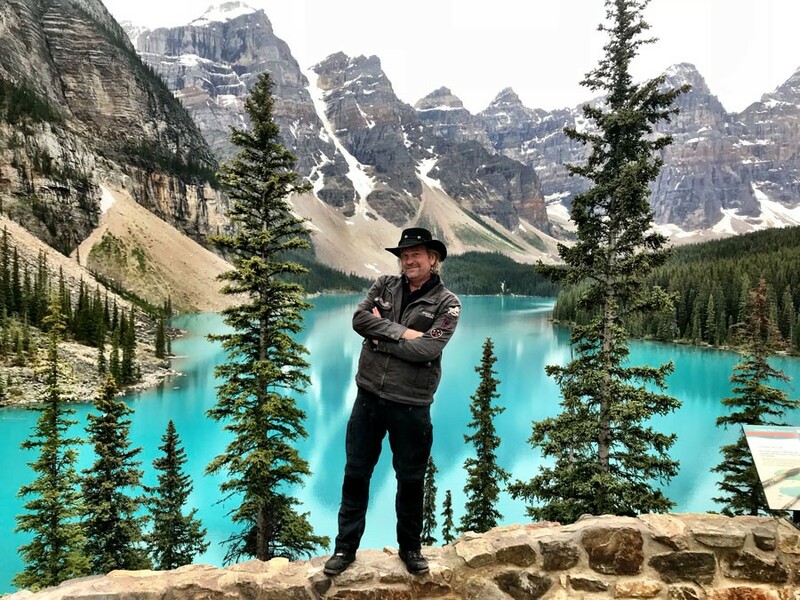 If you love National Parks and hiking, you might be more interested in beautiful places like the Oregon Coast, Death Valley or Ayers Rock in Australia. You could visit the world’s largest waterfall (Iguasu in Brazil), the tallest waterfall (Angel falls, Venezuela), bizarre landscapes like Afar, Ethiopia or Cappadocia, Turkey. There’s lots of interesting scenery underwater like the kelp forests on the coast of California. You could visit all of the National Parks in the US. There’s only 58. You’ve probably already done 5 or 6.
Who doesn’t like dolphins? You’re not finished yet though. Where do you want to swim with dolphins? Find out where a good place to do that might be and write it down. Do 19 more and then you have the list. Good luck. Just having a plan committed to paper can make a huge difference.